Make a small space into a large one. Or illuminate a smaller space in your home with reflected light. Wall mirrors bring beauty and function together no matter what design style you choose. 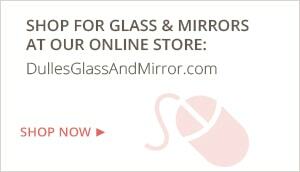 Why Choose a Custom Wall Mirror? Size: Up to a maximum of 48" x 72" (for larger size mirrors, please call for a quote). Shape: Don't forget attractive oval and round! Installation Essentials: mirror clips, j-bars, etc. But don't worry...customizing your mirror is easy with the experts at Dulles Glass. Just submit a quote with the information you do know about your mirror project, and someone will contact you with a preliminary quote for free, in 24 hours. We'll help you get it just right! Wall-to-Wall – Where the edge of the mirrors fits one entire wall, edge to edge. Keep in mind that due to the labor-intensive installation, a true wall-to-wall installation will be more expensive. Short-of-Wall – Where the mirrors cover almost the entire wall, but stops about an inch from each edge. In either case, we are happy to provide you with a quote, but a Dulles Glass installation expert will need to come out and double-check all the measurements before we fabricate the glass for you. In this way, you can rest easy that your mirror will be perfect for your space. Dulles Glass mirrors are made of 1/4" thick glass and all have a safety backing that helps prevent messy and dangerous accidents. Our mirror installation specialists will affix the mirror directly to the wall using a mirror mastic, or glue, for maximum safety. We'll cap this off with J-bars or L-bars, which are used to support the mirror at the top or bottom, along with your choice of decorative clips, standoffs, or rosettes if you prefer.